Share the post "Watch & Wait Method for Fibroids"
This method is recommended only under certain circumstances. This method is for someone with fibroids and no symptoms, or symptoms that are minimal and/or manageable. The logic is that since some fibroids will disappear on their own or will cause only minimal symptoms, it is better not to undergo active treatment unless it is necessary. Fibroid treatments can involve an incision and its inherent risks, as well as a sometimes-lengthy recovery time that takes you away from your daily activities. So, in special circumstances it is best to simply wait and see what happens. ● Your fibroids are small or asymptomatic. ● Your fibroids aren’t causing significant health issues. ● You aren’t dealing with pain, excessive bleeding, anemia due to bleeding, chronic fatigue, etc. ● Your fibroids don’t appear to be growing quickly. ● You don’t wish to become pregnant. ● Fibroids that change the shape of your cervix can affect the number of sperm able to enter the uterus. ● Fibroids that block the Fallopian tubes can make the journey of a fertilized egg to implantation difficult or impossible. ● Fibroids which change the shape of your uterus may decrease the number of places an embryo can successfully implant or reduce uterine space needed for embryo development. ● Fibroids that weaken the lining of the uterine cavity or decrease the blood supply to a growing embryo can cause a miscarriage. As you “watch and wait,” your doctor will monitor them at regular intervals. Development and growth of fibroids isn’t unusual in premenopausal women, but in postmenopausal women, a new or enlarging mass may indicate a malignancy and should be followed up on. I’m watching & waiting. Now what? ● How long do I want to watch and wait? Set a reasonable time line. ● What do I do if the fibroids have a growth spurt and existing symptoms get worse? ● Do I know all my treatment options? 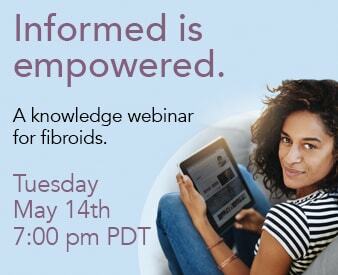 If your fibroids worsen and treatment is needed, make sure you are informed and confident about what direction you will be going in. The Fibroid Treatment Collective has developed a minimally invasive treatment for fibroids. Fibroid Embolization is performed by inserting a catheter and running it to the uterine artery where the fibroid is located. Embolic agents are released that cause the fibroid to shrink. This procedure is non-surgical, low-trauma and offers a speedy recovery. Fibroid embolization is extremely effective, with over 90% of women who have undergone embolization seeing their condition resolve. This procedure also protects a woman’s fertility and does not carry the same level of risks as other surgical procedures. If you have questions about fibroids and treatment options, contact The Fibroid Treatment Collective at (800) 645 – 6095 for more information or schedule a consultation here.